Major price reduction on this beautiful 100' Broward yacht for sale! 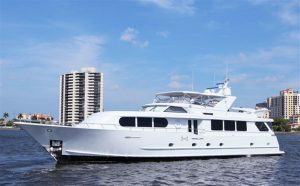 : Atlantic Yacht & Ship, Inc.
Major price reduction on this beautiful 100′ Broward yacht for sale! Looking for a beautiful used 100′ Broward yacht with elevator? Then be sure to see this one for sale with Joe Marino! In the first place, this beautiful used 100′ Broward yacht with elevator is for sale in Palm Beach, Florida. Known as “My Lady,” this yacht is a must see if you are in the market. After all, she has an unusual yet desirable main deck master stateroom. Additionally she has four beautiful guest staterooms including her luxurious VIP. Also, she even features a dedicated laundry room with tons of storage! As can be seen, this used 100′ Broward yacht with elevator is in excellent condition. After all, her aft deck is fully enclosed. That is along with her already spacious accommodations. Moreover it is fully air conditioned which adds to her usable deck space! But wait; there is more. This yacht has a hydraulic elevator lift. That enables easy access from the galley, to the pilothouse, up to the fly bridge. She has been professionally maintained. That is in addition to her 2013 full paint job. For more information on this beautiful used 100′ Broward yacht with elevator contact Joe Marino today! This beautiful used 100′ Broward yacht is available to be seen in Palm Beach! Check out this used 100′ Broward yacht with elevator for sale! Check out this beautiful used 100′ Broward yacht for sale!